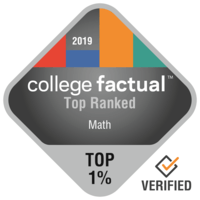 2019 Best Mathematics Colleges in the U.S. Mathematics is a reasonably popular choice with roughly 21,191 graduations each year. This program is ranked 28th most well liked from the 384 subjects of study analyzed by College Factual. Students who graduate with a Mathematics degree enjoy a 12.0% improvement in income when compared to their college-educated peers. This means the major is rated 29 out of 121 with regard to salary potential. Math grads will make around $47,605 in their early career income and $82,811 in their mid-career income. Below you'll see a list of the best colleges and universities to study Mathematics. Our ranking methodology takes into account education quality, average earnings of graduates, accreditation, and several other relevant factors. Massachusetts Institute of Technology is the best option for students thinking about a Mathematics degree. In addition to its bachelor's programs, Massachusetts Institute of Technology offers graduate degrees in Math. Cambridge, Massachusetts is an ideal area for learners who enjoy the fast-paced city life. Harvey Mudd College is a wonderful option for students pursuing a Mathematics degree. Math students from Harvey Mudd College earn a boost of around 25.5% over the typical income of mathematics majors. The location of Claremont, California, is satisfactory for learners who desire a more tranquil, suburban spot. First-year students are required to live on-campus at Harvey Mudd College. With the diverse campus at Harvey Mudd College, you will have numerous chances to meet students from all backgrounds. For more information, look at college scorecard. It is hard to beat California Institute of Technology if you wish to pursue Mathematics as a major. Graduates of the math program earn an average of $56,764 in their early career salary and $99,303 in their mid-career salary. Positioned in Pasadena, California, this school is a strong choice for students who enjoy the exhilaration of a substantial city. It's hard to find a better school than Cornell University if you wish to pursue Mathematics as a major. In addition to its bachelor's programs, Cornell University offers graduate degrees in Math. Ithaca, New York is an ideal environment for college students who enjoy the fast-paced urban lifestyle. University of Chicago is among your best bets if you want to study Mathematics. University of Chicago mathematics students make 20.6% more than the average math grad. Located in Chicago, Illinois, this university is optimum for young people who flourish in an urban setting. This school requires freshman students to live on-campus. There is a graduate program accessible for students who are curious. View all of University of Chicago's rankings to find out more. University of California - Los Angeles is among your best bets if you're planning on studying Mathematics. Graduates of the math program make an average of $58,838 in their early career salary and $108,083 in their mid-career salary. The setting in an important urban center is great for young people seeking out considerable opportunities for social networking, adventure, and exploration. It's hard to find a better school than Princeton University if you wish to pursue Mathematics as a major. After graduation, math students typically make around $58,459 in the first five years of their career. Located in Princeton, New Jersey, Princeton supplies a safe and sound, suburban atmosphere for learners. You will be able to learn about a lot of ethnicities thanks to Princeton's diverse population. Princeton has a leading women's basketball team. Videos from Princeton could be a great way to get more info on the university. It's hard to find a better school than Northwestern University if you wish to study Mathematics. In addition to its bachelor's programs, Northwestern University offers graduate degrees in Math. Northwestern University has one of the largest student bodies in Illinois. Any student pursuing a degree in Mathematics needs to check out Columbia University in the City of New York. Students who graduate from the math program make about $56,963 in their early career salary and $112,317 in their mid-career salary. With over 20,000 students, this school is among the largest schools in the country. Pomona College is one of the finest schools in the United States for Mathematics. Graduates of the math program make about $59,197 in their early career salary and $85,914 in their mid-career salary. The area of Claremont, California, is great for students who prefer a more tranquil, suburban region. The student body at this school is highly diverse and is represented by undergraduates from over 43 states and territories and at least 25 countries. This school does not require freshmen to live on-campus. Learn more to see how well Pomona College ranks in other categories.